Tuck Shop - Happy Dirty 30 to Me!!! For my 30th birthday this year I decided I wanted a fun night out starting with a damn good dinner. 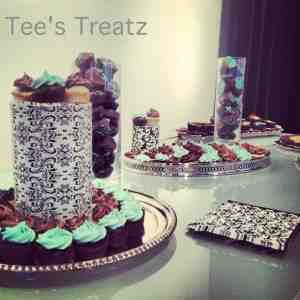 As I searched through my list(s) of restaurants, I came across the perfect option for my birthday – Tuck Shop! It shocked me that I still hadn’t had the opportunity to try Tuck Shop, I had been dying to go for so long, so I grabbed my phone called them and left a message. 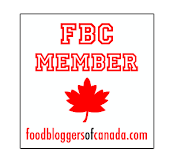 Next thing I knew I was confirming my reservation – Success! We arrived early at Tuck Shop on a busy Saturday night and unfortunately had to wait for our table to be ready. That is one thing I hate about restaurants that offer two different seating options on Saturday evenings; people who opt of the later seating will most likely have to wait for their table – Frustrating! Six of us stood around the front door for more than forty minutes waiting for our table to be ready. I would have thought the staff at Tuck Shop would have offered us a drink or something to appease our evident frustration, but no such luck! We were all very annoyed but I asked my friends to ignore it as I did not want this to ruin my birthday night. We were finally seated forty five minutes after our reservation. Quickly, we chose and ordered a bottle of wine and began drinking away our aggravation. The wine continued to flow all night and so did the food. 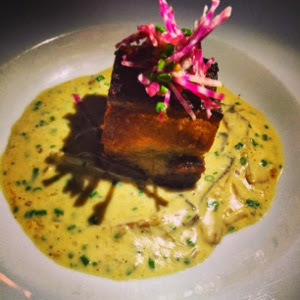 I started my meal with the crispy pork belly with an aged gouda and oyster mushroom sauce. I had wanted to try Tuck Shop solely based on this dish. it was everything I had ever imagined it would be. The crispy pork belly managed to keep its crispiness despite the thick and flavourful sauce. The earthiness of the mushrooms and Gouda cheese complimented each other beautifully. Paired with the pork belly, this sauce elevated this dish to a flavour level one can only dream of. I really hope they never take this dish off their menu. It has to be the best pork belly that has ever entered my mouth. 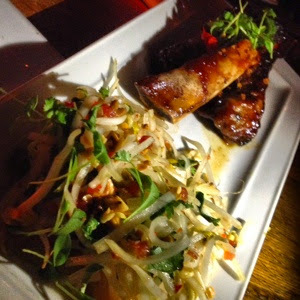 One of my fellow diners started her meal off with the Thai beef rib with a Tamarind glaze and a green papaya salad. I had to convince her to order this dish as she was very hesitant about the papaya salad and the Tamarind glaze. I know my food and I know what my friends like, so they usually listen to my suggestions. After her first bite, she exclaimed how delicious this dish was and thanked me for making her order it. The rib was tender and very well flavoured and the papaya salad was crispy and refreshing. We especially enjoyed the crunch from the peanuts. We also ordered the grilled octopus served with tabouleh, hummus, baba ganoush, lemon labneh and chick pea croutons. A couple of others at the table started with the crispy fish tacos served Mexican style with a fresh pico de gallo and avocado puree. For some reason, mainly the amount of wine I consumed, I did not photograph these dishes but I can attest to their deliciousness. The octopus was tender, flavourful and just really damn good. The fish tacos were good too but I have had better. After the apps it was time for another bottle of wine. We sat drinking and enjoying each other’s company. The staff at Tuck Shop were great and we quickly forget all about the long long forty five minute wait for our reserved table. The main courses arrived and I for one was ready to eat. 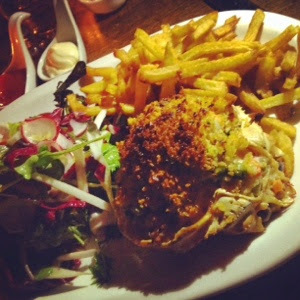 I had decided to listen to our waitress and order the special of the night; baked crab served with a salad and French fries. The crab was picked and cleaned properly then tossed with peas and carrots and a creamy lightly flavoured sauce. Placed back into the shell to bake, this crab was everything the waitress promised. Topped with a bread crumb crust, this dish was flavourful and I really enjoyed each bite. The tender crab meat was delicately flavoured which allowed the fresh flavour of the crab to shine through. The dish was very rich and for the first time ever I understood how some can find crab to be too rich to eat. I still enjoyed this dish but after eating half, I was in crab overload. 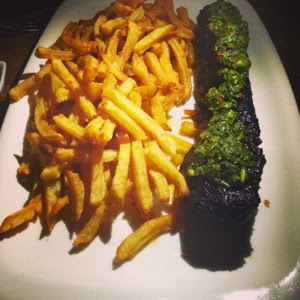 The butcher’s cut was served with a generous portion of perfectly cut golden fried French fries and topped with a delicious chimichurri sauce. The steak was cooked to a perfect medium, just deliciously pink inside and oh so tender. The chimichurri sauce had the right balance of flavours and complimented the steak beautifully. The fries were damn good and added the perfect crunch element to the plate. We ended the night with another bottle of wine and sat around drinking and talking for a while. The best meals always end late with a good bottle of wine and great company, this night was no exception. I do remember a dessert being ordered, but by then we were way passed the “sober” limit and of course I forgot to snap a pic. I think a sparkler was involved too ... It really was a great night!